Japanese Episode AG 058: "Hagane no Tani o Toppase yo! Kootasu VS Haganeeru"
American Episode 330: "All Torkoal, No Play"
The gang has almost arrived at Kinsetsu City, where they plan to pass through before heading on toward Touka City. However, before Satoshi can reach the city and have his promised rematch with Tessen, the gang must pass through the Hagane no Tani ("Valley of Steel") first. As the gang travels along the rocky path, they encounter a Cotoise being attacked by a bunch of Coil and Reacoil. Satoshi and his friends step in to break the fight up, afterwards deciding to travel with the Cotoise in order to protect it. As our heroes continue their way through the valley, they are continually attacked by the likes of Coil, Reacoil, and Airmd. Suddenly, Masato remembers that they had been told that the Valley of Steel was a very dangerous place, and that they should pass through it as quickly as possible! Satoshi-tachi start to hasten their journey, but they are attacked by a Haganeil at the edge of the valley. 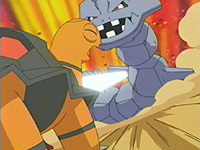 Satoshi guesses that the Cotoise endured all the pokemon's attacks in order to battle this particular pokemon, so the young trainer leads the pokemon in a battle against the massive steel-type pokemon. Haganeil is eventually knocked out by Cotoise's Overheat move, allowing the gang to exit the valley. Once outside, Cotoise decides to continue traveling with Satoshi, and with that the young trainer from Masara Town catches his fourth pokemon in the Houen Region. For a capture episode, this one bored me to tears. We've had the "territorial pokemon" thing done to death, and seeing this coupled with a Cotoise who wants to fight this big steel pokemon for no real reason doesn't make for great television. Another thing that I noticed with this episode is that Takeshi is navigating again. I know this has been going on for a while, but I still wonder; why isn't Masato using his PokeNavi anymore? When he used that thing, the gang rarely got lost, but now that Takeshi is in charge the gang can't seem to go from city to city without making a dozen stops first. The dubbed version doesn't offer any surprises. The first three seconds of the first scene are cut. When Cotoise starts to use its Overheat attack, the third opening theme to the first series, OK!, starts playing. It ends (rather abruptly) when Cotoise delivers the final blow to Haganeil. In the dub, this Japanese song is replaced by regular dub fight music. A whopping four seconds are cut from the scene after Kids' WB! 's final commercial break in 4Kids' continuing struggle against long pan shots. Also, a second is cut from the TO BE CONTINUED... screen.